Command Auto Group has over 40 years of extensive experience in the automotive aftermarket including provision of some of the best electronic products available, and are proud to release this range to the Australian Market. Assists to safely park your vehicle with front and rear sensors (front sensors on selected models only). 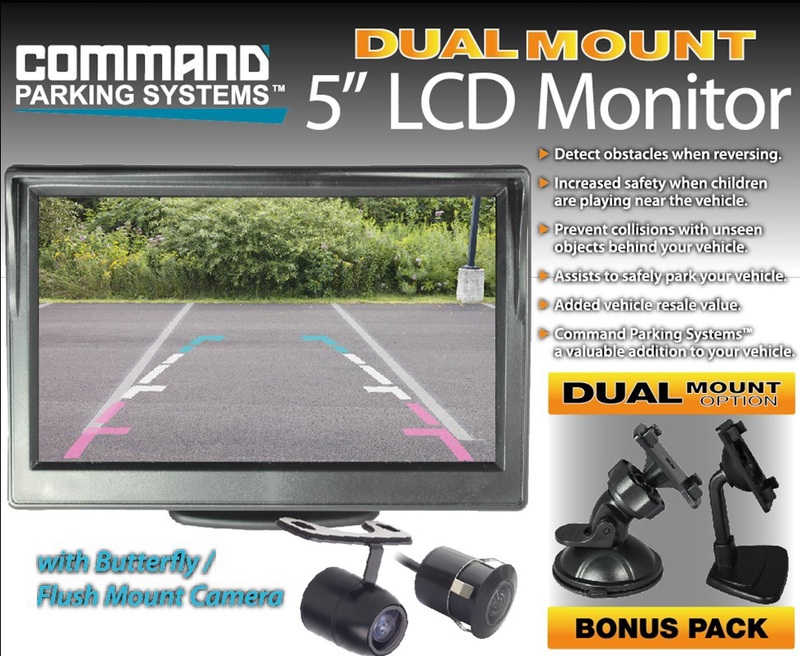 Command Parking Systems™ offers you a range of quality, reliable and high value electronic vehicle accessories. 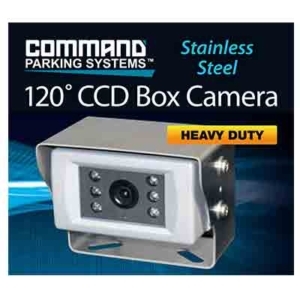 Command Parking Systems™ are manufactured in ISO approved manufacturing facilities and are covered by Command Auto Group’s trusted national warranty service. 12 month warranty is applied for installations done in a DIY installation. 24month warranty is applied for units that have been installed by a professional approved installer. In a vehicle of any age. Warranty is extended up to 3 years when installed by professional installers in new vehicles during pre-delivery. 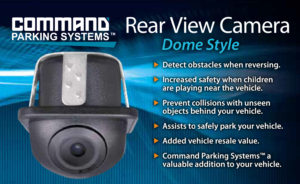 Command Auto Group and their range of Command Parking Systems™ are continuing the leadership in innovation with new innovative products for the more unique vehicle applications. Command Parking Systems™ adopt the latest bionic ultrasonic sensor technology with high speed computer control to assist you with parking in those tight spots. Our quality parking sensors can be used in any weather conditions and detect obstacles from within 2 metres (detection distance varies depending on model selected). This series is available in multiple sensor configurations and offer a 100˚ x 100˚ sensing angle for excellent ultrasonic coverage. The range features flush mount or stick-on premium paintable sensors with the option of purchasing flush mount sensors in 4 colours (black, red, silver and white). 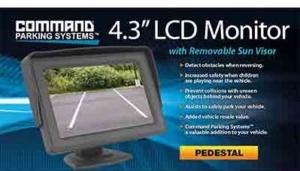 The CMD05 series Command Parking Systems™ are an exceptional quality product, at an affordable entry level price. Featuring a variable stage audible buzzer which can provide an early warning of obstacles behind your vehicle. This series is available in a 2 sensor configuration, or 4 sensor configuration for extra ultrasonic coverage. All models now include premium 21mm sensors. 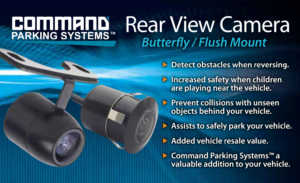 Command Parking Sensors come standard with premium black sensors. Pack Includes: Flush mount sensors, 1 x CMD05 module, 1 x buzzer, power harness, 21mm hole saw, 3M sticky backed Velcro, cable ties. 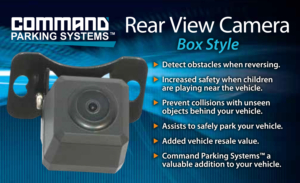 The 91CMD05-4F Command Front Parking Sensor System aids in the detection ofobstructions in front of your vehicle. As this kit is designed for front fitment, power is not taken from the reverse lamp power feed and rather taken from ignition with both brake pedal activation as well as offering a manual activation/deactivation button for added safety. 0.7m – Slow warning beep and red indicator light as distance decreases. 0.3m – Rapid warning beep and red indicator light as distance decreases. Adjustments that can be made to reduce sensor sensitivity levels. switch on the Digital Control Module. Pack Includes: 4 x black flush mount sensors, 1 x CMDO5 front sensor module, 1 x buzzer, power harness, 21mm hole saw, 3M sticky backed Velcro, cable ties, manual activation switch. The quality multi-colour visible display with digital readout indicates to the driver that obstacles are being approached from the left or right side of the vehicle with the approximate distance, in conjunction with a variable stage buzzer. Contains 4 premium sensors designed for rear bumper protection. The system is automatically activated when reverse gear is selected. 2.5m – Green warning light on display. 1.5m – Orange warning light on display and warning beep as distance decreases. 0.3m – Red warning light on display and rapid warning beep as distance decreases. There are 3 adjustments that can be made to reduce sensor sensitivity levels. Inner sensors – for vehicles with a tow bar for example. Outer sensors – for vehicles with spare wheels, 4WD and other accessories. All sensors – adjust for above or personalised reversing applications. format for mounting on the dash ensuring highest versatility. parcel shelf to be viewed through the rear view mirror (upside down and reversed). Adjustable Sensitivity and hook function. This fully optioned system is available in 8 sensor configuration, 4 sensors across the front bumper of the vehicle, and 4 across the rear. The unit features an audible buzzer and visual display. If you demand performance and features, and unparalleled sensor coverage then the 91CMD86 Command Parking System™ is the unit for you. This system works in two ways. Firstly it is automatically activated when reverse gear is selected and will detect obstructions at 2m (behind vehicle) with a slow beep tone which increases as the vehicle moves closer to the obstruction. A visual warning is also displayed on the screen indicating the sensor that is causing the alarm. The final (rapid) warning stage occurs at 0.4 metres. 2.0m – Slow warning beep as distance decreases plus visual warning on display. 0.4m – Rapid warning beep as distance decreases plus visual warning on display. restarts for another 15 second cycle. If an obstruction is not detected the system reverts to standby mode. 0.25m – Rapid warning beep as distance decreases plus visual warning on display. Detecting range: Adjustable sensitivity and hook function. hole saw, 3M sticky backed Velcro, brake switch, cable ties. The CMD10-4 sensors are mounted by small screws. This product is ideal for those who want the protection of reversing sensors on vehicles where they may be mounted under the tray of a ute or commercial vehicle. The CMD10-4 suits 12V and 24V applications. 1.5m – Slow warning beep as distance decreases. 0.3m – Rapid warning beep as distance decreases. There are 2 adjustments that can be made to reduce sensor sensitivity levels. Inner sensors – for tow bar mount for example. This series is available in a 4 black sensor configuration for extra ultrasonic coverage. This system is automatically activated when reverse gear is selected. angle, sensor fitting kit, 3M sticky backed Velcro, cable ties. 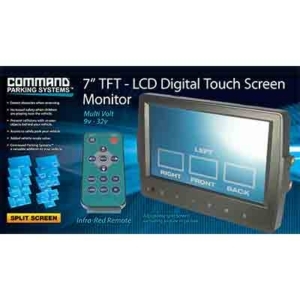 Command Camera and Monitor Systems offers extra safety and versatility. 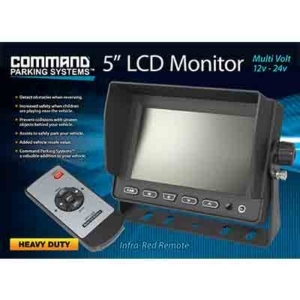 Easily installed and discreetly mounted the Command CMOS/CMD reversing camera systems are a valuable safety feature which add value to your vehicle and can be connected to our various screen options (sold separately with some models). Offering a high quality product with more features than the competition. The range of passenger vehicle reversing systems offers versatility with a selection of stylish screens and high quality cameras at affordable prices. Screens are now available in 3.5”, 4.3” and 5” sizes in pedestal, clip-on mirror, classic replacement mirror and now OEM styles. All passenger vehicle parking systems come with RCA type video connectors to connect directly to the video monitor. The lead from the camera to the power harness has a mini 4 pin connector which means if you are required to drill a hole to enter the vehicle it will be as small as possible. 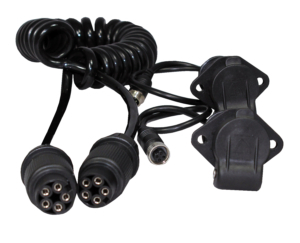 All standard passenger cameras come with the same camera power harness and 6m RCA cable with built in trigger wire that can connect to the reverse lamp to activate screens that require this connection. Includes: Camera with flush mount and bracket mount and bezel, mounting screws, 16.5mm hole saw, mini din to RCA connector, 6m RCA cable. Includes: Camera with mounting nut and washers, double sided tape, mini din to RCA connector, 6m RCA cable. Includes: Camera with number plate bracket and bezel, mini din to RCA connector, 6m RCA cable. Includes: Camera, 19mm hole saw, mini din to RCA connector, 6m RCA cable. 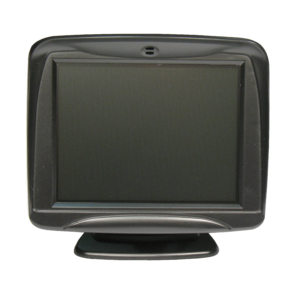 The Command Passenger Vehicle Monitors feature pedestal mount screens with a smooth black finish, sleek body and wide screen designs. These screens never look out of place and perfect for most applications where there is space available within the cabin. Second camera priority – when connected to AV1 the image will be shown on the screen until the reversing camera is activated on AV2 and the screen will automatically prioritise this over AV1. Includes: 4.3 inch screen, 3M tape for mounting, power cable, removable sun shield. The 91CMDS43MOE mirror monitor is perfect for applications where cabin space is tight or when keeping the originality of the vehicle is critical. The 4.3” display will easily replace most existing factory mirrors for an original factory appearance. Sheeth to cover screen wiring harness for factory appearance. Includes: 4.3 inch mirror screen, power harness, fitted “A” type bracket, cable concealing accessories. The Command 4.3” mirror kits are perfect for applications where cabin space is tight. The new Universal Dual Mount Monitor is perfect for applications where cabin space is tight or when mounting flexibility is critical for the installation. The 5” 800 x 480 display will mount on the vehicles dash with the provided pedestal bracket or onto the vehicles windscreen with the use of the provided suction cup bracket for quick and easy install. This screen now comes as a complete kit with the popular C110 Dual Mount Butterfly/Flush Mount Camera making is suitable for professional and DIY installation to any vehicle. 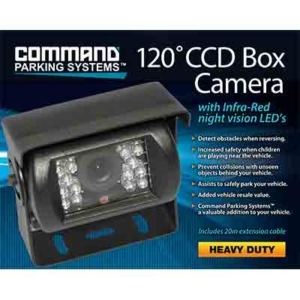 The Command C110 camera features a 4pin Mini-Din connector to assist with the simple installation process as well as removable parking lines and reversible image. Additional Features: Powdercoated aluminium, adjustable camera angle (tilt), microphone. Includes: CCD camera, mounting screws and nuts, rubber grommet. Requires optional extension lead. Dimensions: 68mm (W) x 43mm (H) x 58mm (D), 45mm pivot base. Additional Features: Powdercoated aluminium, 18 x infra-red LED’s, adjustable camera angle. Dimensions: 75mm (W) x 40mm (H) x 55mm (D), 40mm pivot base. Additional Features: Aluminium housing, stainless steel bracket, microphone for audio, adjustable camera angle, 6 infra-red LED’s. Includes: CCD camera stainless steel mounting bracket, stainless steel sun visor, allen key. Requires optional extension lead. Inputs – connect to Reverse camera, DVD, GPS, gaming and other devices. Automatic activation for each input. Input camera priority – separate trigger wire for each input so it can be connected to the reverse lamp, side indicator, brake lamp, bus door and more to automatically display the required image without the need to press a button. Menu functions – input select, image settings – brightness, contrast. Features raised buttons to meet mining and emergency vehicle standards. If gridlines or image reversal are required a camera from the passenger vehicle range and adaptor is required. Includes: 5 inch screen, u-support bracket, mounting bolts, power/AV harness, removable sun shield, remote control. Inputs – connect to reverse camera, DVD, GPS, gaming and other devices. Automatic activation for each input. Input camera priority – separate trigger wire for each input so it can be connected to the reverse lamp, side indicator, brake lamp, bus door and more to automatically display the required image with out the need to press a button. Split screen function – display one, two, three or four inputs on the screen at any time. 4 x video/audio inputs – heavy duty large 4 pin style. 1 x AUX jack input. 1 x Recording video/audio output, 1 x live video output. On/Off, brightness, contrast, colour, volume adjust, language selection (6), AV input trigger priority select, horizontal and vertical image flip, trigger priority, optional gridlines, touchscreen, split screen for 1, 2, 3 or 4 images at once, screen display input adjustment, auto input scanning, auto dim, border colour selection, full functions remote control. Includes: 7 inch screen, centre mount bracket, u-support bracket, mounting bolts, power/AV harness, removable sun shield, remote control. Command Parking SystemsTM offer customers the option of wireless connections for their parking systems whether it be a heavy duty application where cables can not reach or are not practical to use as well as applications where time is a factor and quick installation is required. cameras with 4 pin small plug. cameras with 4 pin large plug. Transmission distances can depend on a number of variables and as such this product is recommended for reliable wireless connections between the front and rear of the car. When fitting out side of the vehicle to a trailer or other it is recommended to be teamed up with a heavy duty camera and extension so both transmitter and receiver can be mounted in close proximity while still providing a wireless connection. Test fitment is always required in these applications to ensure the placement of the transmitter and receiver provide adequate signal strength. Designed to be robust and durable in all conditions and ideal for connecting cameras to monitors in a range of applications for cars, buses, trucks, farm machinery, mining and much more. The industrial-grade aviation-style 4 pin connectors have a locking screw designed to protect from dust and water while providing a very strong and secure connection. This cable combines video, audio and power within the same cable and is designed to simplify the rear view camera hitch and un-hitch process. or inside the towing vehicle to suit a wider range of applications. The kit consists of curly cable with two waterproof super heavy duty 7 pin plastic sockets, upgraded aluminium cap/retainer, and dual large 4 pin type connectors for an easy plug and play installation. however often we find customers request varied configurations that will require additional accessories. Designed to make your towing as easy as possible. A heavy duty rear camera mounted on the back of your caravan, trailer, or any application where camera is not mounted to the towing vehicle. Includes all mounting hardware and componants. 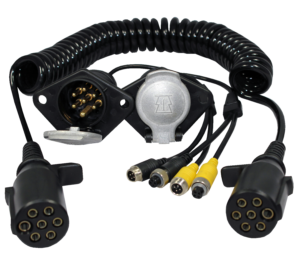 Waterproof heavy duty curly cord, 5 pin plastic sockets with the large 4 pin type video connectors for an easy plug and play installation between vehicles.